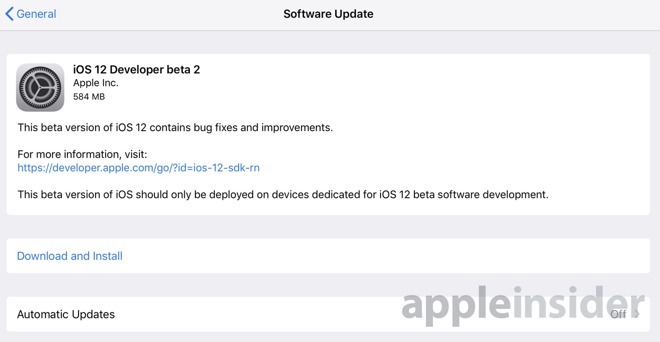 Apple has released its second developer betas of three milestone operating system versions, with new builds of iOS 12, macOS 10.14 Mojave, watchOS 5, and tvOS 12 now available for testing ahead of their expected release this fall. Arriving just over two weeks after the first betas were distributed during WWDC 2018, code for the new betas can be downloaded from the Apple Developer Center, or as over-the-air updates to devices enrolled into the testing program. While public betas usually follow a few days after the developer versions, it is unlikely that one will be issued until further into the testing process for these releases. The second iOS 12 beta is build number 16A5308e, replacing the first build with number 16A5288q. Apple is aiming for performance increases to form a major part of iOS 12, with speed boosts expected for older iOS devices. "Digital health" is also featuring heavily in the release, including a new set of tools called Screen Time for users to see what apps they use the most, and to curtail their usage if necessary. Enhancements to stock apps including Stocks, Weather, News, and Voice Memos have been made, while a new app called Measure will use ARKit to measure objects in 3D space. For the iPad, users can enjoy iPhone X-inspired gestures and grouping of notifications Third-party map support in CarPlay, Siri Shortcuts, Group FaceTime, and MeMoji are also highlight additions. The second developer beta of macOS Mojave 10.14, build 18A314h, replaces the first beta which was build number 18A293u. After years of requests, Apple has included a Dark Mode in macOS Mojave, making it more suitable for night-time use. A dynamic Mojave desert desktop will be included, one that will change based o the time of day. Finder gains a new Stacks feature for organizing files and images into groups on the desktop. Gallery view in Finder will show all media, complete with full metadata for images, and contextual quick actions to perform custom automator tasks on selected files. Quick Look has also been updated to invoke Markup without needing to leave the menu, and now videos can be trimmed within Quick Look without using a separate editor. A Screenshot HUD makes it easier to take images and videos of the desktop, also with a reduced load on the processor. The Continuity Camera will allow users to use their iPhone or iPad's camera to instantly insert a photograph into a document, without needing to manually send it to the Mac. Part of a project to enable developers to make iOS apps work in macOS, Apple has updated some first-party iOS apps, including News, Stocks, Home, and Voice Memos. The Home app, the central control for HomeKit, will be brought to the Mac in this way. The Mac App Store is redesigned with a new UI, including video previews, that borrows elements from the iOS App Store. New machine learning tools called Create ML and Core ML 2 are also included. The newest beta for tvOS 12 is 16J5303e, replacing build 16J5282n from the first beta. The key changes arriving in tvOS 12 include the long-delayd Dolby Atmos surround sound, which can locate sounds in 3D space instead of relying on discrete channels. More TV services will use the Apple TV as a replacement for the cable box, including Charter Spectrum later this year, Canal+ in France, and Salt in Switzerland. The Single Sign-On will be followed up by "Zero Sign-On," a concept where the provider's network will be detected and the Apple TV will automatically sign users into channel apps. More home control systems will link their remotes to the Apple TV and include support for Siri, while cross-device AutoFill will bring passwords to tvOS from their iOS equivalents. Lastly, the Aerial screensaver will offer location details with a swipe and a tap, and a new Aerial view "Earth" filmed from the International Space Station is also viewable. WatchOS 5 allows users to challenge any of their contacts to a 7-day activity competition, with progress updates given to all of the participants and even awards for winners. The features allow specific workouts related to hiking, yoga and 12 other activities, as well as outdoor runs with pace alerts. It even offers automatic workout detection, in addition to stress detection if Apple Watch determines the user has stopped. A standout feature is the Walkie Talkie app, which will enable push-to-talk communications between Apple Watch users. Once established, communications are instantly broadcast to the other device once the button is pressed, with the audio playing automatically through the recipient Apple Watch's speaker. Additionally, watchOS 5 now allows third party apps on the Siri watch face, including those from Nike. The operating system now no longer requires saying, "Hey, Siri," to trigger Siri on the Apple Watch. Instead, the virtual assistant can be called upon simply with a raise of the wrist. The first watchOS 5 beta was pulled by Apple, after it "bricked" some developer's devices. It returned shortly thereafter with a fix, but no changes from the initial release. The milestone releases of the operating systems are not the only versions currently undergoing beta testing. Developer betas for iOS 11.4.1, macOS 10.13.6, tvOS 11.4.1, and watchOS 4.3.2 are being shaken down before release, which will almost certainly take place this summer long before the milestone versions ship. AppleInsider, and Apple itself, strongly advise against installing beta releases on mission-critical hardware, due to the potential loss of data. It is suggested that those interested in trying out the betas use secondary devices for testing, and to keep backups of any important data before installing or updating the software.